RRBJ has a section over to the left that says Red River Area Bloggers. We need to do a better job of updating it because there a couple of interesting reads we don't have listed. Voice of Schleuss is one. We just added Highland neighbor Deb. Don't know why don't have Loren Demerath's down. If you want to be added to the list we do have some rules. We'd like for you to have been blogging for a couple of months before we list you (we're still pouting because Nadine hasn't updated since February). Trudeau always has good reads listed on his two main blogs Shreveport and Faces. Did you know he also blogs here and here? It's fun finding these almost secret blogs. Almost as much fun as walking the dog at night in South Highlands just so we can look in the windows of all the houses that have the lights on and no drapes hanging. We are peeking in! Kathryn, you are too kind! All this attention. And to return your comment on doing a video episode on the vents, prolly not a grand idea. There wouldn't be any footage, save me getting angry, then cooling off. Now, at least, I'm not angry so much anymore. I have a clean bed to sleep in! That's all that matters to me. CFG - you have been added. Sorry it took so long. 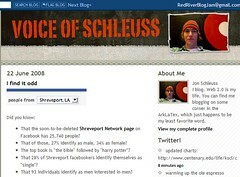 I'd love to see you put Shreveport in your flickr tags.